Augustus Vincent Tack, Aspiration, 1931. Oil on canvas, 74 1/4 in x 134 1/2 in. The Phillips Collection, Washington, DC, acquired 1932. The Phillips is currently hosting the exhibition Art and Wellness: Creative Aging. The display features work from an ongoing collaboration between The Phillips Collection and Iona Senior Services. The program encourages older adults (many of whom suffer from chronic illness, including Alzheimer’s or related dementia), along with their families and caregivers, to make connections and access personal experiences and long-term memories through gallery conversations and hands-on art therapy. Participants in the program looked at Augustus Vincent Tack’s Aspiration together. 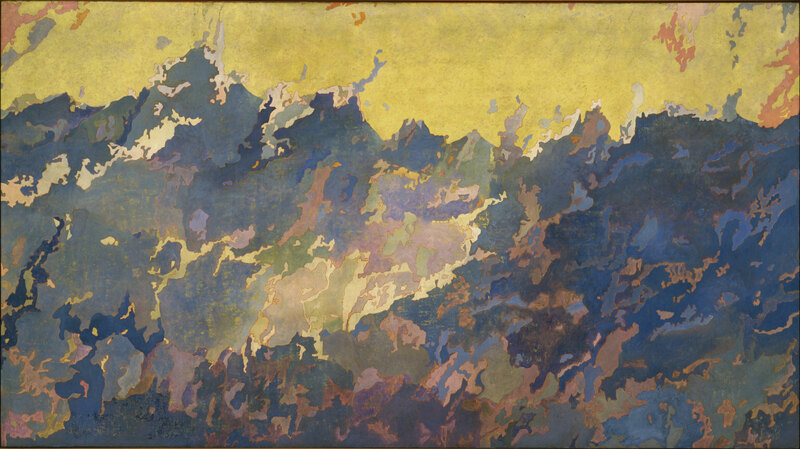 Members of the group saw movement, landscape, and weather in Aspiration. One individual described the painting, saying, “It’s almost like several storms are taking place at the same time—and some of it is water stirred up, the clouds stirred up. With the yellow you see some sunshine.” Another also saw rain in the painting and was struck by its motion. A different group member imagined hearing “water” and “splashing” as she looked at Aspiration. Bringing the words motion, water, and storms into the art therapy studio, individuals were encouraged to develop movement in their artwork. 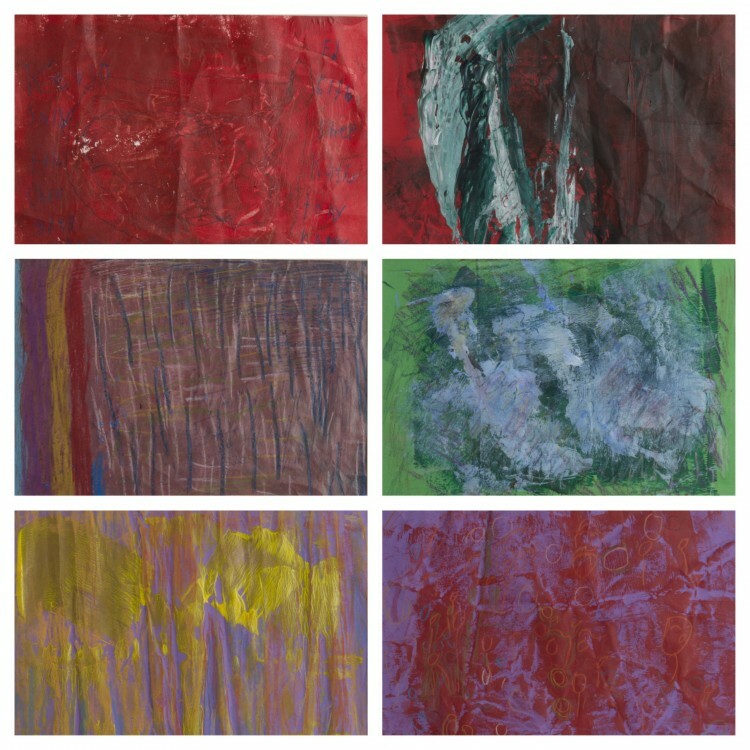 Crumpling paper to create grooves, group members spread paint on top of the textured paper. They incorporated detail and form by adding pastel and pencil markings on top of the paint. This playful process inspired and excited group members, helping to foster an understanding of how texture can impact composition and mood. (Top left) Patricia Abell, Family, 2014. Acrylic paint and oil pastel on construction paper. (Top right) Isom “Ike” Hunter, Untitled, 2014. Acrylic paint on construction paper. (Middle left) Mildered Howard, The Perfect Paint, 2014. Acrylic paint and oil pastel on construction paper. (Middle right) Alexander Tscherny, Untitled, 2014. Acrylic paint and oil pastel on construction paper. (Bottom left) Susan Morgan, Eye Opener, 2014. Acrylic paint and chalk pastel on construction paper. (Bottom right) Michael Schaff, People who know each other at a party, 2014. Acrylic paint and colored pencil on construction paper. (Left) Walt Kuhn, Plumes, oil on canvas, 40 x 30 in. Acquired 1932. The Phillips Collection, Washington, DC. (Right) Marion “Duke” Green, Untitled, 2014. Watercolor and colored pencil on paper. In the art therapy studio, Duke was drawn to Kuhn’s use of portraiture. He reminisced about his time drawing on the Atlantic City boardwalk with charcoal, and how he would identify women that inspired his work. He was eager to replicate the image: “It’s hard to go back to drawing after so many years. You see, I used to draw people’s portraits. 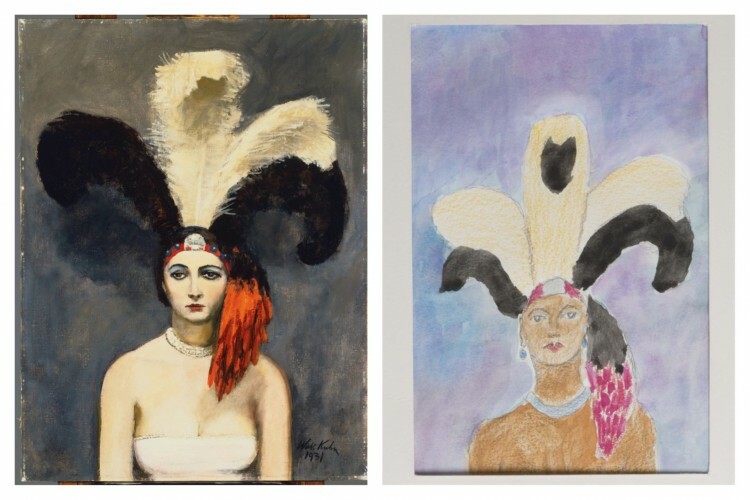 But over time I’ve grown comfortable with it again.” Duke’s experience replicating Plumes gave him the confidence to continue to immerse himself in the artistic process, and reinvigorated his love for portraiture. With our Art and Wellness: Creative Aging exhibition the Phillips celebrates our ongoing collaboration with Iona Senior Services. The program encourages older adults (many of whom suffer from chronic illness, including Alzheimer’s or related dementia), along with their families and caregivers, to make connections and access personal experiences and long-term memories through gallery conversations and hands-on art therapy. In October, the Phillips opened Art and Wellness featuring over 60 artworks created as a part of the program.